In a video that's been making the rounds online, a herd of cows recently freed from a dairy farm runs to a grassy pasture and, apparently, collectively begins to jump for joy. But is it really that simple? 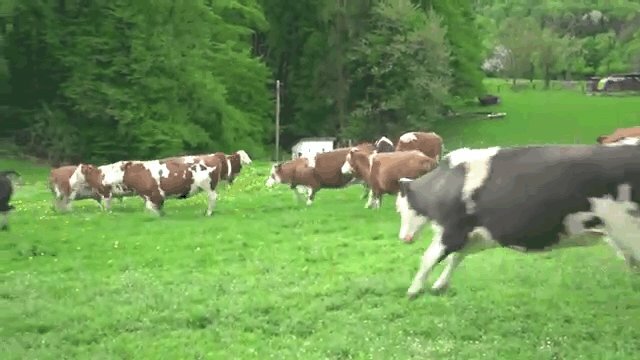 Did the cows actually leap for the lawn because they knew their milking days -- and the prospect of being sent to the slaughterhouse -- were behind them? The short answer: no. According to NPR's rundown of what's really going on with these cheerful bovines, the cows likely weren't jumping for joy, but they did have reason to be excited. "Turns out, the cows pictured hadn't just been 'freed from a dairy farm,' as the title of the video suggests," Maria Godoy reports. "Still, they had quite a history." With their milking days behind them, these dairy cows had been headed to the slaughterhouse, according to the video's subtitles (it's in German). But an animal welfare group called Kuhrettung Rhein-Berg stepped in to offer the cows a retirement home. In this video from the group, we see the animals relishing their release from their winter housing into the great outdoors. What we do know... is that cows love a change of scenery. And a switch from the concrete floors of the indoors to a soft green pasture would surely help break a bovine's winter blues, [de Passille] says. In fact, cows are suckers for novelty, adds de Passille's colleague, Jeffrey Rushen. They get an extra spring or leap in their step "whenever something new or unexpected happens," he says – say, changing their bedding or letting them out or back in. "We think it's a sign that things are well with them." But cows aren't ones to get too excited, de Passille and Rushen explained. The animals will only jump for about five or 10 minutes a day, usually at dusk. "They often do it right before sunset," de Passille said, presumably because the change from light to dark gets them riled up. "Then they can really jump... It's quite the rodeo. It's really a party."